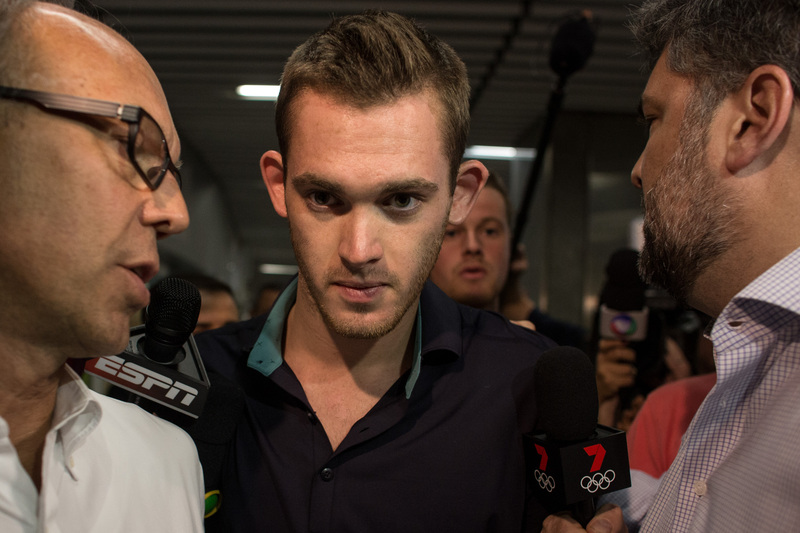 After a confusing turn of events surrounding an alleged armed robbery of four Olympic swimmers, Gunnar Bentz is detained in Rio. The U.S. Olympic swimmer was one of the four who were allegedly robbed in Rio de Janeiro on Aug. 14 at some point between 4 a.m. and 7 a.m. local time. The other swimmers were James Feigen, Ryan Lochte, and Jack Conger. The alleged robbery took place as the swimmers were heading back to the Olympic Village after attending a party at France House, a club in Rio. The swimmers claimed that while they were in a taxi, people who were dressed as armed police officers held them at gunpoint and stole their wallets. However, surveillance video of the swimmers told a different story — one in which the swimmers were clearly unshaken, as the joked around with one another, and they still had valuable items like their phones and watches. Brazilian officials declared that Lochte and his teammates lied about the robbery, allegedly as a way to hide their "rowdy" gas station incident. Brazilian police told ABC News that "one of the swimmers was seen on CCTV footage breaking down the door to the bathroom at the gas station and fighting with a security guard." Though it's unclear which swimmers were involved in these things, Bentz was definitely one of the Team USA "victims" in this alleged robbery incident. Bentz was removed from his plane Wednesday, along with his teammate Jack Cogner, as they tried to fly back home to the United States. A Brazilian judge had ordered they be detained in Rio until further questioning and investigation takes place. The swimmers' passports were also temporarily held until the case is solved. Gunnar, who's given name is Joseph, was a four-time medalist at the FINA World Championships. At Rio, he helped Team USA secure a gold medal in the 4x200-meter freestyle relay. He also took a silver and bronze medal at the 2015 Pan American Games, according to this Team USA bio. He is a student at the University of Georgia and was born in Atlanta, Georgia. Bentz started swimming when he was 3 years old. Though he was not as well known as Lochte before this robbery incident, he is quickly becoming a household name as the investigation into what actually happened that night continues. Bentz and Conger are expected to testify to a Brazilian judge at some point on Thursday, Aug. 18, but it's unclear when that will happen or if he will be able to return home once that's finished.